Rigid multi-storey car park coating for heavily mechanically stressed surfaces suitable for traffic according to the “Directives for the protection and repair of concrete structures of the German Reinforced Concrete Committee” DIN EN 1504:2. 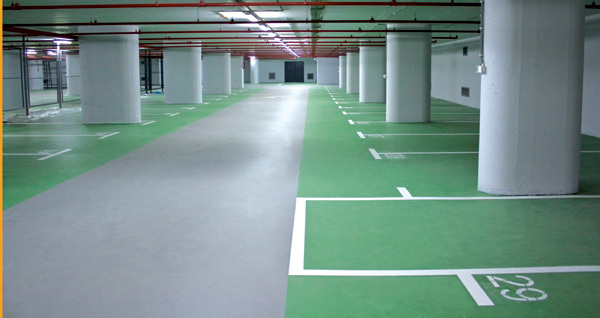 Two-layer epoxy resin system for multi-storey car parks or underground garages on concrete or similar subsurfaces. As a rule fl oor slabs in contact with the ground are not subjected to extreme dynamic stress like intermediate or open-air decks. Besides the resilience, here the requirements are the protection against aggressive substances that damage reinforced concrete, against rising damp, the visually user-friendly colored design and fi nally the non-slip quality.